Amarin, a Dublin, Ireland-based company, has announced positive results from its REDUCE-IT trial testing Vascepa, a prescription omega-3 fatty acid, in adults on statins with heart disease or diabetes and other risk factors for heart disease. The study followed 8,179 participants for nearly five years. Almost 58 percent of the trial participants had type 2 diabetes. Vascepa is an FDA-approved therapy for people with very high levels (greater than 500 mg/dl) of triglycerides, which are a type of body fat. For most people in the US with private, Medicaid, or Medicare insurance, Vascepa costs about $3-6 per month with a co-pay card. Fish oil has been a subject of much discussion in the cardiovascular field. Fish oil supplements generally contain two kinds of omega-3 fatty acids, EPA and DHA, and research shows fish oil can lower high triglyceride levels. However, there have been many clinical trials, such as the ASCEND trial, that have failed to find any heart health benefit from fish oil in people with diabetes. But, these supplements included DHA, which is thought to potentially elevate LDL, the type of cholesterol traditionally associated with worse health outcomes. 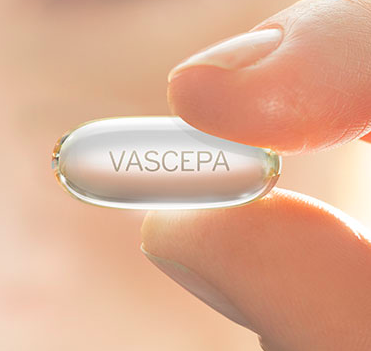 In addition, Vascepa contains a much larger dose of EPA than typical fish oil products. In the ASCEND trial, participants were also at low risk for heart disease and were taking a low-dose of just 1 gram per day. In contrast, the REDUCE-IT trial studied a high-risk population and prescribed a higher dose of 4 grams per day. In addition, Vascepa only contains EPA. These might be the reasons this trial showed more positive outcomes. The REDUCE-IT trial studied over 8,000 adults with very high triglyceride levels and statin-controlled LDL cholesterol between 41-100 mg/dl (ADA’s recommended goal for people with diabetes is below 100 mg/dl). Overall, the most commonly reported side effect of Vascepa was joint pain (arthralgia). The press release also notes that the safety profile was similar to other study data on omega-3 fatty acids. As people with both type 1 and type 2 diabetes are at increased risk of heart disease, this research around heart-protective therapies is promising. As a relatively low-cost drug, Vascepa may have the potential to help a wide range of people with diabetes and high triglycerides. One thing to note is that individuals on Vascepa will likely be required to take a total of four capsules per day – two capsules, twice a day.